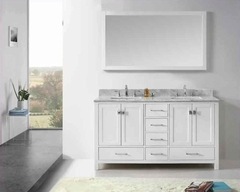 THIS PRODUCT INCLUDE(S): 1x undermount sink in white color (324), 1x quartz top in bianca carara color (17461), 1x vanity base in walnut color (17471), 1x miscellaneous part in walnut color (18105). Has a large cabinet with two soft-close doors and European style hinges. Fully adjustable in-out and up-down European style hinges that are completely concealed when doors are closed. Cabinet hardware included. No assembly required. Faucet and accessories not included. Completely finished from all sides including back. 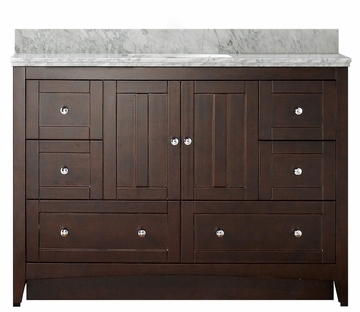 Features six drawers constructed with sturdy joints and soft-close slides. Drawers completely finished on the inside. Vanity base constructed with plywood and veneer. No MDF or chipboard used. Includes adjustable floor levelers under the legs for uneven floors. Knock-out plumbing backboard for easy water supply and drain access. Features a kick plate. Non-porous top with superior performance against staining, scratching and scorching. Countertop has smooth, easy to clean surface and is in a sleek Bianca Carara colour. Countertop surface has an antimicrobial production protection. Undermount Sink has inside dimensions of 16.5-in. X 11.75-in. And an outside dimension of 18.25-in. X 13.5-in. Sink has smooth non-porous surface prevents from discoloration and fading. Double fired and glazed for durability and stain resistance. Quality control approved in Canada and re-inspected prior to shipping your order. Sink has a premium white glaze for a glossy finish with a kiln dried ceramic construction. 1.75-in. Standard US drain opening.